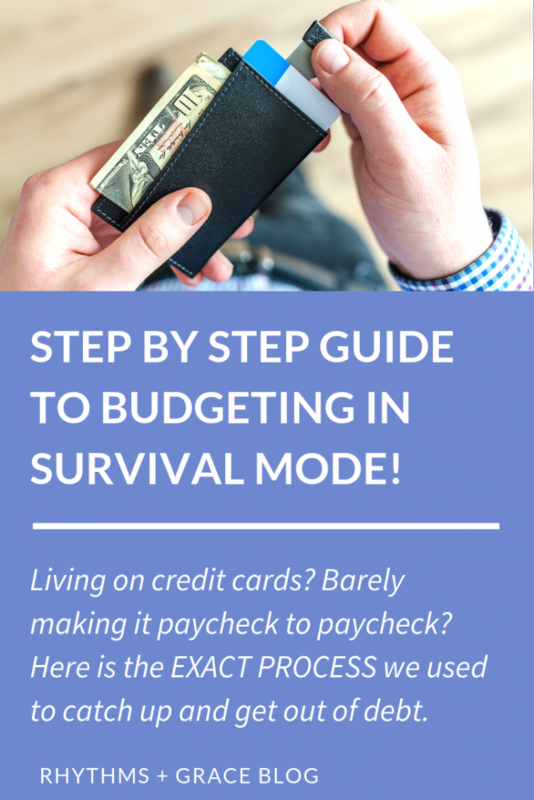 Budgeting In Survival Mode | Step by Step Guide to Getting Out of a Mess! Budgeting and tracking your spending are helpful habits for anyone who wants to achieve financial goals, but budgeting when you’re in survival mode financially is a non-negotiable!! If you are exhausted by your financial mess, or not sure what the first right step is, this post is for you! You will learn exactly what to do, step by step, to get out of financial survival mode. It will not be easy, and it may take some time. But, you don’t have to be where you are 1 year from now. You can start controlling your money instead of letting it control you. Are you ready? Let’s go! The first part of getting out of financial survival mode is figuring out what went wrong. How did you get here? Maybe something happened that was out of your control – a spouse’s secret spending or a massive medical debt. A crisis reveals a process that’s been going on for a long time. And if you are in a financial crisis, something has been going on for a while that caused the mess. The good news is, money is concrete, and turning your finances around is actually pretty simple. Notice, I said simple. NOT easy. No, it’s definitely not easy. If YOU caused problems, it takes immense self-discipline to learn new habits. If the financial crisis is because of someone else, then there is probably relational pain to deal with. Why am I in this financial mess? Okay, now tear up your paper! Come on, just do it! It’ll feel good. That’s in the past. Time to move forward. Changing habits may be hard, but the formula is simple. Here it is… the world’s not-so-secret formula for financial success. live on less than you make for a long period of time. As somewhat of a finance blogger, I feel like it would make me more successful if I told you there was a super big secret formula and I had all the tips and tricks and just keep reading my blog and buy my products and you’ll win!! But there are no secret formulas… just living on less than you make and managing the extra wisely. I know you’ve probably heard that phrase before, so I will help you with more step-by-step details. But, you have to embrace that philosophy for any of the practical tips I give you to work! Manage the extra money wisely. When we were budgeting in survival mode, we used the Dave Ramsey baby steps because it made sense to us. His basic method is to do one thing at a time. You don’t try to build an emergency fund AND get out of debt AND save for college AND save for retirement AND pay off your house AND give tons of money away simultaneously. You’d never make progress in any of the goals. Instead, use all your extra money to focus on one thing at a time, in a specific order, until you have reached financial freedom. You can read about the baby steps another time, but for now I’ll walk you through the exact process we used for budgeting in survival mode. Here’s what you need to do, day in and day out to begin budgeting in survival mode. 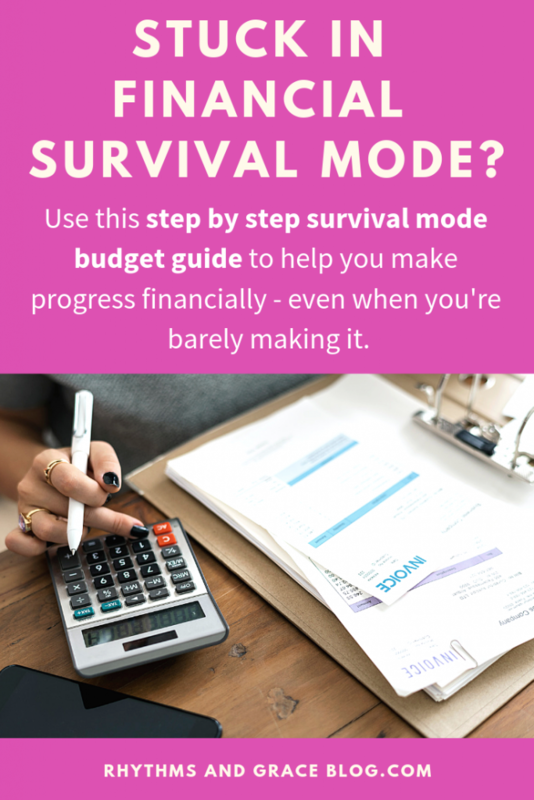 Once you’re out of survival mode, you can make a more normal monthly budget. This is no time to be wondering how much money you have in the bank. You have to know exactly how much you have, when you’re getting paid, and when things are due. 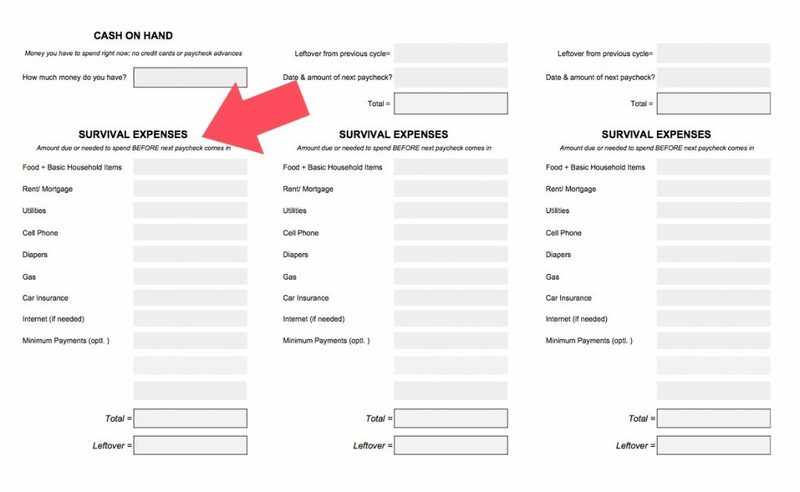 I made a free worksheet for budgeting in survival mode to help you with this. 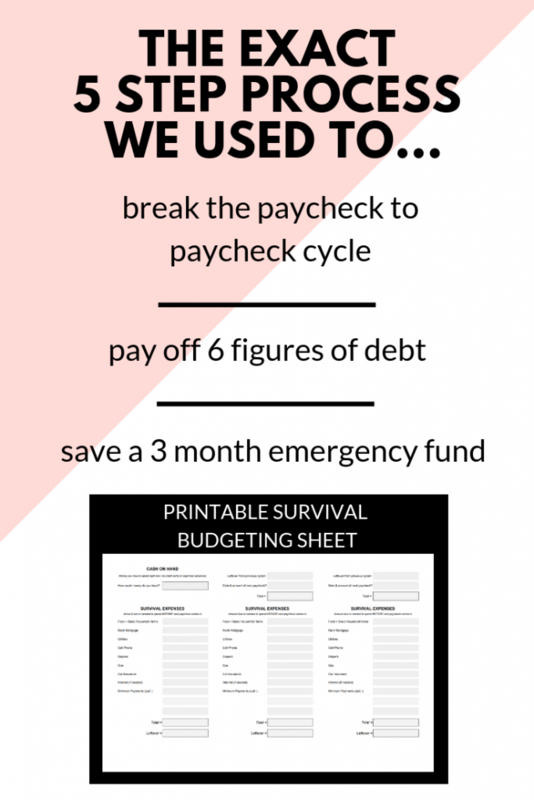 Send me the printable survival budgeting worksheet! Otherwise, just follow along with the post & write your numbers down on a blank piece of paper. I highly suggest you download it immediately and get to work! Step #1 – How Much Do You Have? Total up the amount of actual money accessible to you in a bank account. Not a line of credit or your next paycheck or retirement money. 2. 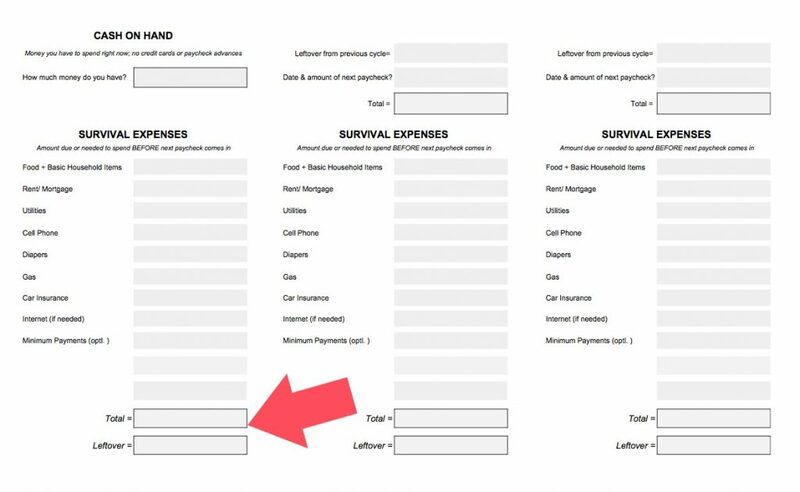 Make a Survival Expenses List. This is money you need to spend before your next paycheck. Use the worksheet as a guide. You will be budgeting paycheck to paycheck for right now. 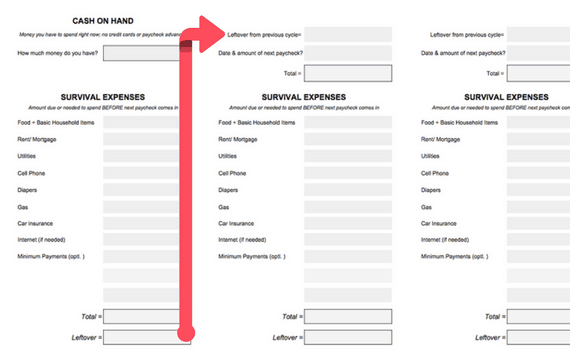 For example, if your rent isn’t due before your next paycheck, it doesn’t go in this column. Only write down exactly how much you need to spend on food before your next paycheck comes. This isn’t your forever budget, it’s your survival budget. Add up how much you need to spend until your next paycheck and figure out how much money you’ll have leftover. Cable & other tv services (yes, even netflix). What else am I forgetting!? Put it in the comments below and I’ll add it to the list. Cancel it all. Return all your recent purchases. Cook what you have until you have no food left in your house. If your kids are older, you can divulge as much as you want. You don’t want your children to feel unsafe or stressed about the financial situation. But it’s okay to explain debt, explain the basic principles, and try to get them excited about your family’s financial goals. Maybe create specific mini rewards along the way. Watch some of the families who do their debt free screams on Dave Ramsey’s Youtube. 4. Figure out how much leftover money you’ll have for the next paycheck cycle and write it down. 5. Write down expenses you’ll have during your next couple paycheck cycles. Look at your calendar while you plan to make sure everything gets paid on time. You should be able to see the leftover amount getting higher and higher if you continue to live on bare bones survival expenses for a few paycheck cycles. The less you can live on, the faster you’ll be able to get out of a financial sinkhole. WHAT IF YOU DON’T HAVE ENOUGH TO MAKE IT TO THE NEXT PAYCHECK? If, even after cutting all your extra spending out, you still don’t have enough money to make it to the next paycheck without a credit card, you either have a serious expenses problem or a serious income problem. I have another post on figuring that out: Do I have a spending problem or an income problem? We were pregnant with our second child, and had just moved across the country after my husband finished his 1 year master’s program. We’d spent the year living on student loan money, so we had a massive pile of debt to pay off. The student loan money ran out (we were pretty terrible at budgeting it), and my husband wasn’t slated to start his job for a month. So, we started putting necessary purchases on a credit card. Talk about survival mode! Most of his first few paychecks went to paying off the credit card we’d been using to live on. We cut up the cards and learned how to budget the money we had in the bank. 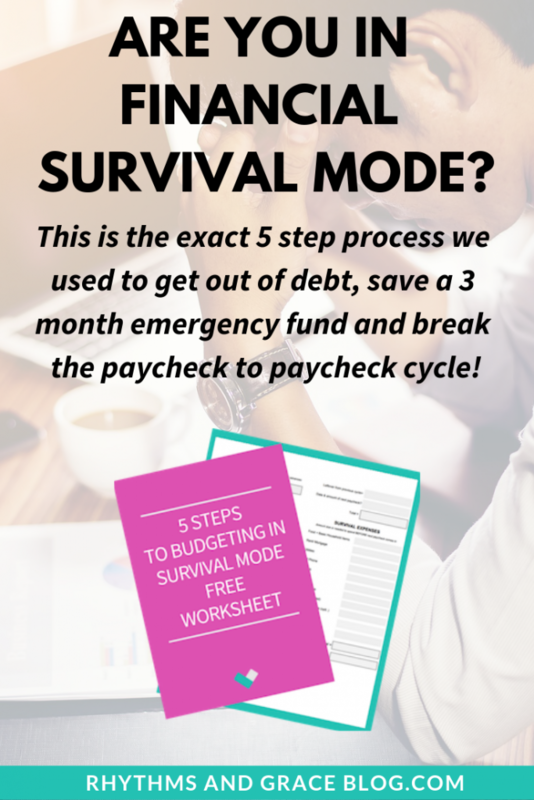 We used this exact system when we started budgeting in survival mode! After about 6 months of playing catch-up, we were able to save a $1,000 emergency fund, put a more sustainable budget in place, and set goals for how much extra we’d pay off in debt each month. 4 1/2 years later, our finances look DRASTICALLY different. We paid off all the student loan debt in 3 years. We live a month “ahead” of our expenses, so we’re no longer living paycheck to paycheck. We know how to communicate with each other about finances. We have systems in place that make budgeting feel more like routine maintenance than teeth-pulling torture. We are not perfect at budgeting or financial experts. We are normal people. And if we can budget in survival mode, get out of debt, and achieve financial goals, anyone can! We have experienced it first hand and I really want anyone who wants it to experience it too. You can do it! If there’s any way I can help or cheer you on, let me know in the comments or by hitting reply to an email. 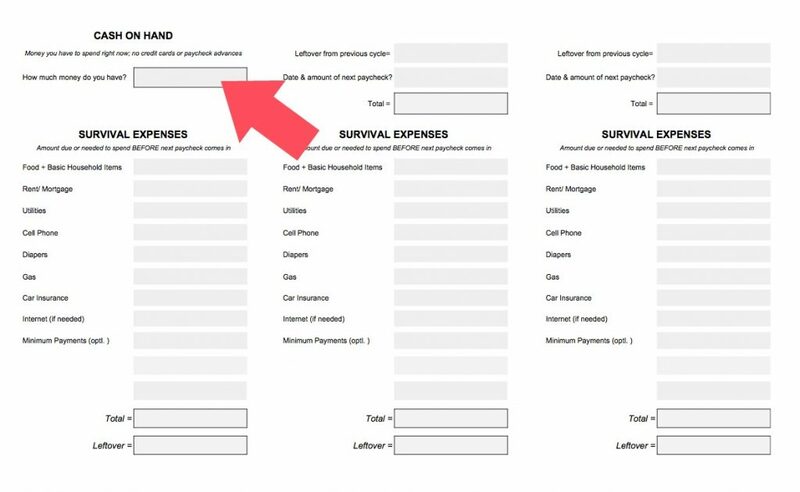 Here’s the budgeting survival worksheet one more time.